Analyst say Karrubi's age and temperament recalls an "Iranian John McCain"
(CNN) -- Mehdi Karrubi, the only cleric in Iran's presidential race and a former parliamentary speaker, has been dubbed the "Reform Sheikh" by Iranian media. 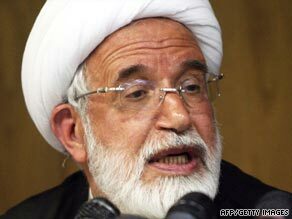 Iranian cleric Mehdi Karroubi, 72, is vying for the presidency. The 72-year-old is well known in Iran, and he received international press in 2002 when he led a walkout to protest the jailing of a fellow politician who called himself a reformist. In 2005, he ran for Iran's presidency and came in third to current President Mahmoud Ahmadinejad. Karrubi alleged the process was corrupt. Like his 2009 political rival, Mir Hossein Moussavi, Karrubi promises to free political prisoners, transform Iran into a place that is socially open and allow women more freedom. He was speaker of parliament from 1989 to 1992 and 2000 to 2004, but it's difficult to find quotes from him. There are a few recent statements posted on the Web site of Press TV, an English-language media outlet funded by the Iranian government. "Ensuring equality between men and women was one of the aims of the Islamic Revolution, and this desire was reiterated many times by the founder of the Islamic Revolution, Imam Khomeini," he said according to a May 19 report. "I consider the presence of women in [my] cabinet, as ministers, deputies and presidential advisers as a necessity," the agency quotes him saying. Geneive Abdo said that is "just campaign rhetoric." Abdo worked in Iran as a reporter for The Guardian, a British newspaper, between 1998 and 2001, but said she was expelled from the country for writing articles that included voices of dissidents. Abdo has written three books about Islam and was host at a conference this week about Friday's election. "Actually reforming the system in ways they are promising is highly unlikely, because people forget the repression under Ahmadinejad isn't the work of a man but an entire system," said Abdo, a fellow at The Century Foundation, a nonprofit public policy research institution based in New York. "As a cleric, Karrubi has the support of other clerics," she said. "But that isn't enough. Clerics are not as involved politically as they used to be. He's not really considered a serious candidate or a real challenge to Ahmadinejad." Ahmadinejad won the presidency in large part by wooing the rural, poorer areas of Iran and portraying himself as a so-called man of the people, analysts have noted. Karrubi has vowed to distribute the nation's oil and gas profits as subsidies to poor Iranians older than 18, according to PressTV, Iran's government funded news agency. This attempt to identify with the working class, coupled with Karrubi's age and temperament, calls to mind an "Iranian John McCain," Karim Sadjadpour recently wrote on the Carnegie Endowment for International Peace's Web site. "He can be both a maverick and an economic populist, considered one of a small handful of Iranian politicians willing to voice his disagreements with Supreme Leader Ayatollah Khamenei," wrote Sadjadpour, who has interviewed senior Iranian officials and is the former chief Iran analyst at the International Crisis Group, based in Tehran. Khamenei is the most powerful figure in the nation. He has been the Supreme Leader of Iran since 1989 and was the president from 1981 to 1989. On the most sensitive issue this election -- the economy -- Karrubi has blasted Ahmadinejad for misguided market policies. But Karrubi has also maintained his record of supporting state control over the economy, according to analysts. In 1988, Karrubi founded and led the Association of Combatant Clerics, which advocated keeping state control of the economy, according to several international reports, including the International Iran Times, which says it is an independent media source based in Washington.